Guitarist Michael Bruce was an integral part of the sound and fury that was the original Alice Cooper band. Co-writer of many of the band’s best-known and beloved songs, Bruce was around for classic Alice Cooper albums like Love It To Death, School’s Out, and Billion Dollar Babies. After Alice left the band to pursue solo stardom, Bruce and fellow bandmates carried on under the name Billion Dollar Babies at first, recording a single album titled Battle Axe. The guitarist would later forge a lengthy and impressive solo career that includes a half-dozen albums as well as a pair of recordings with the band Ant-Bee. 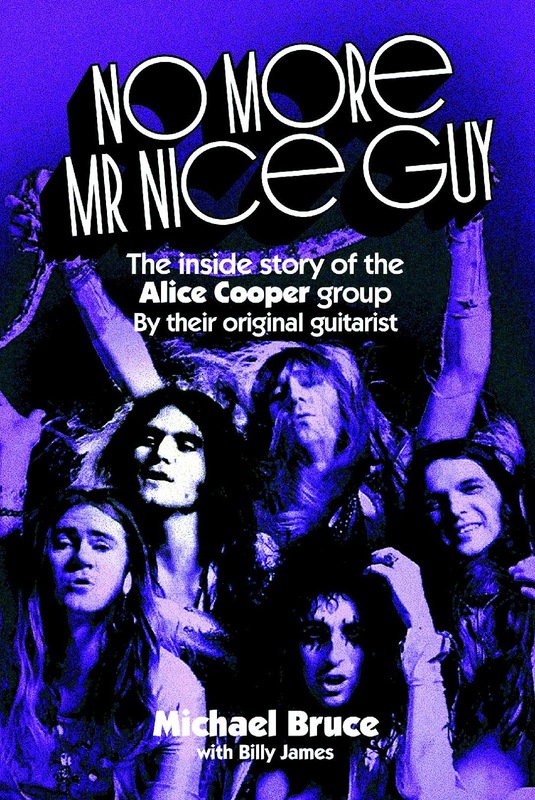 In February 2018, Gonzo Multimedia will be reissuing Bruce’s critically-acclaimed biography No More Mr. Nice Guy as part of a limited edition box set. The box includes the book, written by Bruce and his Ant-Bee bandmate Billy James, originally published in 1996 and recently updated; as well as a signed certificate, a 1996 interview CD, and reproductions of Alice Cooper group memorabilia. The box set is limited to 250 copies and is currently available for pre-order through PledgeMusic. For Michael Bruce/Alice Cooper fans there are also a couple of other items on the Pledge Music page that might pique your interest. If you don’t want to pony up $67 for the deluxe box set, you can buy Bruce’s No More Mr. Nice Guy bio by itself for a very reasonable $13.50 (plus shipping) and/or pick up a copy of the very first show by Billion Dollar Babies on CD for a mere $12.15 (plus shipping). Performed in Flint, Michigan in 1977, Billion Dollar Babies included Bruce, Dennis Dunaway, and Neal Smith from the original Alice Cooper band as well guitarist Mike Marconi and keyboardist Bob Dolin. The book and the CD are available in a bundle for $24 (plus shipping). In a press release for the box set, Bruce says “it’s not often we get a chance to redo, remake or, in this case, re-release a book...my book. It is with much thought, great enjoyment, many thanks, and heartfelt appreciation for family, friends, and fans that I present the re-release of No More Mr Nice Guy, a compilation of hilarious rock ‘n’ roll stories and life events that made me the man I am today.” Check it all out on the PledgeMusic website. It’s great, thank you! I bought 2 box sets!